sees everyone at DMR in an excitable mood as we begin our 50th anniversary celebrations. We have quite a year lined up with over 25 events - both large and small - planned for our friends. We’ll be in touch as the year progresses and we hope that you can join us on one or two occasions if possible. Springtime sees the end of the watch and jewellery show season and so far this year, the DMR teams have attended shows in Geneva for SIHH, Vicenza Oro in Italy, Hong Kong and of course, Baselworld, from where I penned this introduction. Baselworld itself had a calmer feel to it this year. The show was certainly less busy as some brands took the opportunity to introduce new lines from other locations, as Omega did in Zurich. Our teams were also at that event to witness the launch of the 50th Anniversary Moonwatch. Rolex and Patek Philippe have pushed on this year with several new additions. In Patek Philippe’s case, the new 5212A Calatrava Weekly Calendar will be eagerly awaited, as will the Nautilus 5276 and the new 5520P complete with alarm. Rolex took the opportunity to launch a GMT Master II with blue black bezel (ref 126710 BLNR on a Jubilee bracelet with 3285 Calibre) to complement last year’s highly successful “Pepsi GMT” which is still much sought after. As for the new YachtMaster 42, well, we will keep you posted. At DMR we enjoy an excellent reputation amongst the brands for doing things correctly, professionally and in the right spirit. This is why we export such a small percentage of our allocations overseas, preferring instead to focus on our local and loyal clients instead. This is a policy we will maintain, along with our now famously recognised desire to always go the extra mile for our clients. Our clients, and the brands they collect, trust DMR. 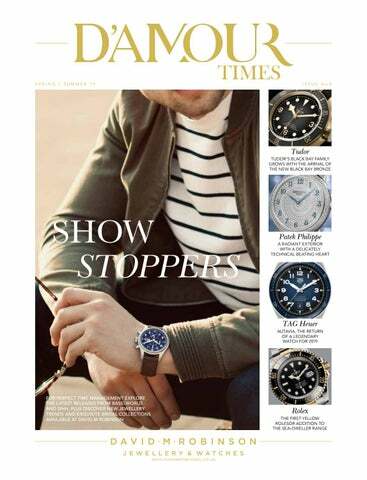 Three of the best watches from the horological trade fair in Geneva Also at Baselworld, TAG Heuer further established its successful niche as a genuine innovator and we were impressed by the new Autavia Isograph. Tudor continued to delight and surprise in equal measure with the Black Bay P01. If ever a watch had an unusual history, it is this particular story. Earlier in the year at a snowy SIHH in Geneva, IWC introduced four new Pilot’s Top Gun references and after wearing his IWC at the Oscars, Bradley Cooper’s IWC Big Pilot sold at a charity auction for $75,000! Closer to home, we have been kept busy with several projects. Our new workshop in Altrincham has allowed us to innovate and develop more and more bespoke pieces. We started out from a workshop 50 years ago and today our goldsmiths maintain that tradition. One of our main focuses this year, however, will be the opening of our newly extended Manchester showroom in St Ann’s Square. We are investing more than £2 million into the project to bring you a 5,000sq ft showroom complete with new Rolex-approved workshops and Rolex VIP areas as well as a private salon which will, I hope, be a suitable setting for our new DMR jewellery and bridal collections. We consider St Ann’s Square to be our spiritual home and as Manchester city centre grows with new residencies and restaurants, so we hope to take the luxury offering to new heights. Manchester’s ability to pull in visitors from all over the North West remains the talking point of the retail scene outside of London. Whilst in this edition of D’Amour Times we focus on some of our latest jewellery collections, it remains the case that no business ever really thrives without great people working within it or as clients. As we grow, we are certainly attracting a fashionable following with DMR pieces being seen on numerous celebrities. Nothing would be possible without our showroom teams and their support and I’m delighted that DMR, in its 50th year, remains an independent family business, which not only makes beautiful things but which also makes its clients happy and which tries to make the world around it a better place. A newly-refurbished and expanded David M Robinson workshop has opened in Altrincham in time for the brand’s 50th anniversary. Two skilled goldsmiths, Dawn Welch and Tony Duffy, make up the Altrincham team. Both have worked with DMR for many years and have experience working across all the UK showrooms. The new workshop combines traditional methods of crafting jewellery with modern technologies to provide the very best service for clients. Panerai Later this year, Max Sirena, skipper of Italy’s Luna Rossa, will take to the waters of Sardinia in a bid to become the official challenger of 36th America’s Cup. Thanks to Panerai, he will do so wearing a watch manufactured from the same material as the hull of his 75ft sailboat. The watchmaker has created the Submersible Luna Rossa, a 47mm dive watch constructed from superlightweight, corrosion-resistant carbon fibre. In 1985 Swiss watchmaker Heuer – creator of the Autavia, Carrera and Monaco – became TAG Heuer when it was acquired by Luxembourg-based investment consortium TAG Group. The three letter prefix, should you have ever wondered, is an acronym for ‘Techniques d’Avant Garde’. For us the best booth at SIHH 2019 had to be IWC. In the middle of an aircraft-hangar-inspired stand, a gleaming silver Spitfire took centre stage – the same plane that’s scheduled for take-off in a round-the-world record attempt later this year. On the outskirts of Geneva, a different spitfire landed onsite during the brand’s gala dinner, attended by a squadron of ambassadors, including Bradley Cooper, Rosamund Pike, Dev Patel, Adriana Lima and James Marsden. Putting the ‘TAG’ in TAG Heuer’ then, is this year’s Carrera Calibre Heuer 02T Tourbillon Nanograph. An evolution of what was already the brand’s most complex timepiece – the Carrera Tourbillon Heuer 02T caused ripples when it was launched in 2016 for marrying a COSC-certified chronograph with the industry’s most affordable tourbillon – the updated Nanograph now houses a balance-spring manufactured from carbon; a first in watchmaking. A balance-spring, also known as a hairspring, is a coiled spring attached to the balance wheel of a mechanical watch. It controls the speed at which cogs turn, and thus the rate at which hands rotate. Carbon, says TAG Heuer, trumps both precious metals, from which hairsprings were traditionally constructed, and modern silicon, towards which many brands have recently turned, for its shockproof properties and resistance to gravitational, magnetic and temperature variations. The aviation-themed festivities coincided with the launch of a five-reference family of new Spitfire watches. Designs are inspired by the instrument style of the Mark XI, a utilitarian timepiece that was produced in Schaffhausen for the Royal Air Force from 1948. Panerai also launched two timepieces in homage to freediving world champion Guillaume Néry. Both chronograph-equipped dive watches are water-resistant to a depth of 300 metres and equipped with a unidirectional rotating bezel. The 45mm watch is decorated with hexagon motifs, a reference to the nanoscopic hexagonal structure of the carbon used in the hairspring – hence the name. The dial and rotor have both been openworked to reveal the movement, and the aluminum balance wheel is set with both white gold weights and white Superluminova, making the watch’s beating heart visible in the dark. Neon green accents add drama, adorning everything from the tourbillon cage to the column wheel. The collection includes an entrylevel time-and-date automatic, a chronograph, GMT, world timer and perpetual calendar. All house IWCmanufactured calibres. The Timezoner Spitfire Edition ‘The Longest Flight’ has been developed for airmen Steve Boultbee-Brooks and Matt Jones, the co-pilots who will attempt the crosscontinent record attempt. The world time function is adjusted by pushing down and rotating a black ceramic bezel, which simultaneously rotates the hour hand and the 24-hour display. A red central GMT hand and small-seconds hand contrast with a dial made from the same cloth as Luna Rossa’s sails. Capable of displaying the duration of a dive thanks to unidirectional rotating bezel, the timepiece has a date window at 3 o’clock and a three-day power reserve. Tudor Black Bay Bronze Winner of the Petite Aiguille prize at the 2016 Grand Prix d’Horlogerie de Genève, the Black Bay returned at Baselworld with a new slate-grey dial and bezel. Its stunning 43mm bronze case, an aesthetic nod to old ships and diving equipment, will develop a patina over the years due to the properties of the metal. The overall visual effect is that of a rich, patinated object that might have sailed the globe on its wearer’s wrist for years at a time. Powering the watch is the Manufacture Calibre MT5601, which is the widest of Tudor’s movements. With its non-magnetic silicon balance spring and 70 hour power reserve, the movement is certified as a chronometer by the Official Swiss Chronometer Testing Institute (COSC). Patek Philippe 4978/400G – Calatrava “You never own a Patek Phillipe. You merely look after it for the next generation.” The chairman made this motto clear at Baselworld 2019; Patek Phillipe will remain in the private hands of the Stern family. For 2019, the Patek Philippe Diamond Ribbon Joaillerie is available in a new white gold design with a slightly larger diameter, increased from 33.3 mm to 36.5 mm. The intended result of the distinctive diamond embellishment is to “orbit the case like gymnasts’ twirling ribbons.” Set with 770 diamonds in total, with blued gold applied numerals, the watch’s slim and elegant profile is maintained thanks to the integration of the Caliber 240 ultra-thin selfwinding movement. Rolex Yacht-Master 42 Rolex has a history of accompanying hardy adventurers and sailors, including Sir Robin KnoxJohnston and Sir Francis Chichester. Chichester said about his Rolex watch: “It was frequently banged, also doused by waves coming aboard; but it never seemed to mind all this.” With its Cerachrom bezel insert in matt black ceramic, almost completely resistant to corrosion and scratches, the Yacht-Master has been designed with this rugged functionality in mind. Like all Rolex Professional watches, the Yacht-Master 42 offers exceptional legibility in all circumstances, and especially in the dark, thanks to its Chromalight display. The Oysterflex bracelet combines the robustness and reliability of a metal bracelet with the flexibility, comfort and aesthetics of an elastomer strap. Inside the 18ct white gold case, the calibre 3235 is featured for the first time offering fundamental gains in performance from the previous model. Patek Philippe 5212a - Complications There are several characteristics that make the 5212 unique. Patek Philippe hasn’t made a steel Calatrava since 2017 and before that, the 1970s. The typography created explicitly for this watch is based on the handwriting of one of the manufacture’s designers; its letters and numbers are absolutely unique.Coupled with the simple calfskin strap, it makes it very avant-garde by Patek’s standards. The new complication inside is built on the caliber 324 movement, which tells the day, date, month and the week. Rolex Sea-Dweller A paragon of robustness and reliability, the Oyster case of the Sea-Dweller is guaranteed waterproof to a depth of 1,220 metres, making it just as comfortable at the bottom of the ocean as it is in the boardroom. Original features remain: the helium escape valve, patented by Rolex in 1967, acts as an escape valve for excess pressure built up during resurfacing. For the first time however, 18ct yellow gold has been introduced to the Sea-Dweller on the bezel, winding crown and centre links of the bracelet, giving it a dramatic bold look. Inside, the 2019 SeaDweller contains the new high-performance calibre 3235, offering fundamental gains in terms of precision, power reserve, resistance to shocks and magnetic fields, convenience and reliability. Back in 1948, to celebrate the brand’s 100-year anniversary, OMEGA released its first chronometercertified wristwatch with an automatic movement. The model, named the Centenary, was so well received that the watchmaker decided to get to work on a full collection of chronometer-certified watches. Four years later, the Constellation arrived – it was the first time a watch company had created a family of watches that consisted only of chronometers – and OMEGA required a symbol of precision to use on the watches’ casebacks. The brand found inspiration from the past. In 1933, the company had achieved a world record for precision at the observatory of Kew-Teddington. The company repeated the achievement in 1936, when it returned to the same observatory and set another world record for precision in all categories – an accomplishment that remains unbeaten. Then, in 1945, the Geneva Observatory introduced the ‘wristwatch-sized’ movement category to its annual precision contests and, in the eight years that followed, OMEGA won six times. So, in 1952, when a symbol was required for the Constellation collection, the OMEGA designers created an observatory cupola, reminiscent of the Geneva Observatory, surrounded by eight stars – two for the two world records of 1933 and 1936, and six for the contests won between 1945 and 1952. The symbol has remained on casebacks ever since. Today, the design we most associate with the Constellation collection is ‘Manhattan’. Launched in 1982, it introduced the timepiece’s four characteristic claws – originally a way of making the watch water resistant. Now, the collection has been bolstered by 101 new women’s models. While the iconic Constellation design has been retained, the family – available at 29mm, 28mm and 25mm – has received a full makeover with subtle changes found in nearly every angle. The new matte-finish Constellation is embellished by polished bevelled edges along the case and bracelet, while slimmer bezels provide a wider view of the dial. The Constellation claws have also been slimmed down and the teeth on the crown given a feminine half-moon shape, following the half-moon facets of the case. On the dial, the new indexes are inspired by the Manhattan skyline, most notably the triangular facets of Freedom Tower. On the casebacks of the 25 mm and 28 mm models, the famous observatory medallion is used. To launch the collection, OMEGA enlisted the help of actresses Nicole Kidman and Liu Shishi, models Cindy Crawford and Alessandra Ambrosio and fashion photographer, Damon Baker, who shot a selection of images with a minimalist concept based on a modern interpretation of the Manhattan skyline. Isograph. Featuring a bidirectional 60-minute bezel, broad sword-shaped hands and an oversized crown, the piece has a cockpit-inspired aesthetic and functionality. The Autavia is available in seven variations, with two remarkable Bronze references as highlights. The Bronze models boast eye-catching features: one with a smoked green dial and the other with a brown dial and both rounded off with ceramic bezels. London-based American jeweller Jacqueline Rubin first approached Georg Jensen with her initial ideas for the Mercy collection in 2003. At the time, the brand was unable to devote its attention to the project, and Rubin’s trio of designs were instead made under her own name. Now, 15 years later, the line is being reintroduced in partnership with the Georg Jensen brand and extended with 12 additional pieces. A reminder to be compassionate to others, the Mercy collection comprises contemporary bangles, rings, pendants and earrings that merge Rubin’s fluid design language with the silversmith’s signature sculptural aesthetic. Curvilinear sterling silver loops of varying thickness have been fashioned into hoops, bangles and an inimitable neck ring, while a trio of cascading earrings see the metal warped into winding coils and sloping strands to create sleek, delicate decorations. In honour of David M Robinson’s milestone anniversary, the design team has refreshed its signature suite of diamond jewellery. The Stepping Stones collection, which is available in 18ct yellow and rose gold, is inspired by pebbles that form a path across a small brook. In a dazzling nod to the natural obstacles often found in these habitats, the latest suite is scattered with round brilliant-cut diamonds. The new iteration includes earrings in 18ct yellow and rose gold and two complementing rings, one set with 1.97ct round brilliant-cut diamonds and the other scattered with 0.96ct diamonds, and set on a dainty band of brushed gold. We all find our own Silver Lining in life and our collections of diamond jewellery are often used to mark memorable occasions in the lives of our clients. Fluffy cloud formations formed the basis of the Silver Lining collection, a playful take on the weather. Designed in-house at the Cheshire studio, the new range reimagines the motif in striking 18ct white, rose and yellow gold earrings and pendants. Each accessory is peppered with round brilliant-cut diamonds and inlayed with black rhodium, a striking contrast to the sparkle of the stones. The Giallo collection takes its name from the Italian word for yellow – a fitting moniker for the line of yellow gold pieces, each of which was inspired by two of Italy’s most beautiful cities and their quirks: Venice and its lovers’ locks – the padlocks that pepper the railings of its canal bridges – and Florence and its jewellers, who favour the warm golden hues seen throughout the Giallo collection. The range includes a quintet of exclusive drop earrings fashioned out of 18ct yellow gold and available in varying styles, from the shoulder-skimming Sphere set, worn by Tess Daly on Strictly Come Dancing, to the eye-catching Tribal pair. A complementing line of necklaces and wristwear with chain links and beaded detailing complete the collection. What’s your favourite piece of jewellery from the new collections? My favourite piece of jewellery from our new collections is the 18ct Yellow Gold Giallo Sphere Necklace. The polished finish of the decorative spheres adds a little bit of lift and glamour to any outfit, whether it be casual attire for dinner with friends or cocktail wear for a gala. In addition, the hue of the yellow gold adds a little extra warmth to every colour palette. What are the top jewellery trends for the season? We’re seeing a real trend for chain details this season, and our Giallo link collection epitomises this trend. Available in 18ct yellow gold, it is a softer way to present an otherwise industrial style. The necklaces are approximately 24 inches and designed to be worn in a single strand sitting somewhere around the bust area. They can be worn simply and elegantly by themselves or layered with several pendants and chains – another trend for 2019. What’s the biggest mistake most people make when shopping for jewellery? People make too many rules for themselves in terms of how they should be wearing jewellery.The constraints of tailoring and dressing for your body shape do not apply here. Jewellery should be a reflection of whatever you’re feeling and whatever you want to project to the world. Too many ladies are trying to stick to the antiquated rule that you do not mix metals. That is the biggest mistake. Yellow, rose and white golds are soft tones and so all complement one another perfectly. There is absolutely no reason why yellow gold rings can’t be worn with a rose gold pendant, or white gold earrings with a yellow gold bangle. Throw out the rulebook, stop restricting yourselves and buy what you love! What are your top tips for caring for your jewellery? I have several: Don’t wear your rings at the gym, and mums should be careful if their pram has a metal handlebar, don’t wear long chains if you’re doing anything active and always remove your earrings by pulling the stud from the front – there’s a risk that you’ll bend the earring back and this is how they get lost. But my number one tip is to bring your jewellery to us regularly to get it checked. We’ll always clean it for you at the same time and give you a glass of champagne to enjoy while you wait. White Gold Diamond Drop Earrings Our White Gold diamond drop earrings are a playful addition to our Statement collection, with pavé set diamonds cascading from the ear. Yellow Gold Shoulder Duster Earrings Our mixed cut diamond shoulder dusters combine the classic elegance of round brilliant cut diamonds, with the softer contemporary cut of a baguette diamond. Stylishly combined in yellow gold, they are the perfect accompaniment to any occasion. Twist diamond ring, where a shaped band may be required. When selecting a ring from DMR’s carat collection, we always provide the certificate and discuss the properties of the stone with the client. We offer a bespoke service at DMR. If a customer is very specific about the colour, clarity and carat weight, and we don’t have something in stock that matches, we can source a new stone. You can then choose what style and mount you like to create a very personal design. It is lovely for us to be part of so many memorable occasions. Only recently we assisted a client in booking a rooftop table at Zuma in Rome for an extra special proposal. Being at the heart of London’s business district means our business truly is international. An Australian client recently enlisted our help to create the perfect engagement ring to propose whilst working in the UK for an American bank! Many of our clients often become good friends. Building a relationship with our clients is always very special. s Liverpool reverberated to the sound of The Beatles, a young goldsmith was continuing to learn his craft. It was David Robinson’s daring designs and willingness to take risks that set him apart from other jewellers at that time and led him to win two prestigious De Beers Diamonds International awards in the early days of the business. Since then, his eponymous jewellery brand has continued to grow. In 1982, the brand designed an exclusive pendant for Geraldine Rees, the first female jockey to complete the Grand National course. Just a few years later, DMR was commissioned to design exclusive rings for the Liverpool FC and Everton FC players, Kenny Dalglish and Howard Kendall, in Ruby and Sapphire team colours to mark both teams facing each other in the FA Cup Final. 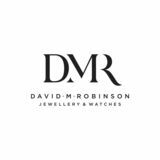 50 years on from its founding on a small workbench in Liverpool, DMR remains a destination for diamond jewellery for clients across the UK and now has four luxury showrooms and more in-house goldsmiths than any other retailer in the North West of England. By servicing your watch, you can guarantee that your beautiful timepiece remains a treasured possession for many years to come. This is particularly important for those who invest in heritage, designer or antique watches as an heirloom. In such instances, the minor cost of a service is highly worthwhile in the scheme of maintaining such a beautiful asset for generations to come. The dedicated after-sales team includes two highly skilled Rolex-accredited watchmakers who are on hand to ensure your treasured timepiece is kept in impeccable working order. “I am extremely proud to be one of a select number of Rolex-accredited watchmakers, meaning I am uniquely qualified to work on their timepieces. This ensures that only genuine Rolex parts are ever used in our workshop and guarantees that we are always equipped with the most up-to-date tools and training,” Mike enthuses. As well as this, DMR boasts a network of strong relationships with some of the finest luxury watch manufacturers in the world. Should on-site teams be unable to undertake the work themselves, your timepiece can be returned to the brand’s own UK service centres. I enjoy all aspects from creating a relationship with our clients to helping them select the piece of their dreams. What is your favourite collection? The Hopscotch and Love Lines are amongst my favourites. Our Hopscotch suite with its playfully set princess cut diamonds has surged in popularity. What type of jewellery does DMR particularly excel at? As we were founded in a workshop, we continue to excel at handmade, bespoke pieces. This makes our work very customer-focused and allows them to tell their own story through DMR’s designs. Has your customer profile changed over the years? I would say that the customer profile has changed. Clients are more informed now and most have a good idea of what they want. Jewellery and watches have become an indication of status, and also more women are now buying their own pieces. What do you enjoy working on the most? It is lovely to have the opportunity to work with some older pieces. It is so rewarding to see a piece which is almost 50 years old that has stood the test of time. What is key when it comes to purchasing a quality piece? I am proud to still be here after 40 years! It is so lovely to have sold engagement rings to clients 30 years ago and now to be helping their children all those years later. Feeling the weight of a piece is often indicative of its quality. Design is obviously crucial as well. It is the creativeness of a design which first draws the client’s eye to a piece of jewellery. What do you love about the DMR brand? One moment that really stands out is when a client decided to bring his wife into the showroom under the pretences of getting her other DMR jewellery cleaned but she was taken by surprise when she was presented with a new ring as her husband went down on one knee and asked her to marry him again. That is very difficult to say; there have been so many amazing stories. It makes me proud to see our business constantly putting our clients first. We always want to make sure they have the best experience of DMR. © COPYRIGHT 2019 DAVID M ROBINSON LIMITED. All material strictly copyright and all rights reserved. Reproduction in whole or in part without prior permission of Luxury London Media Ltd and/or David M Robinson is strictly forbidden. All content believed to be correct at time of going to press. For repair, servicing and valuations, please see our website for details. All prices are correct at time of going to press. Prices are subject to change without notice. E&OE. David M Robinson does not officially endorse any advertising material or editorials for third-party products included within this publication. David M Robinson respects the privacy of every individual who receives D’AMOUR TIMES publication. Any information collected about you will be used to fulfil the delivery of the magazine, for readership profiling purposes and for further marketing of David M Robinson products and events. We do this by making appropriate use of the information. This information will not be disclosed to anyone outside of David M Robinson, its affiliated or associated companies, its agencies, dealers, partners or licensees. It will be treated in accordance with the relevant legal provisions concerning data protection and may initially be stored and processed inside or outside the European Union anywhere in the world. You have the right as an individual to find out what information we hold about you and make corrections if necessary; you also have the right to ask us to not use the information, as well as the right to opt out completely. Any data protection request should be directed to David M Robinson, 14 Railway Street, Altrincham WA14 2RE or data@davidmrobinson.co.uk.